What visit to North Sulawesi is complete without one day to view the spectacular coral gardens of the Bunaken Marine Reserve. Declared a Marine Park in 1991, it is acknowledged as one of the top dive sites in the world. It is about 40 minutes drive from the resort to one of the dive centers or to the central harbor, where a motorized outrigger canoe or dive boat will whisk you to Bunaken Island in about 45 minutes. 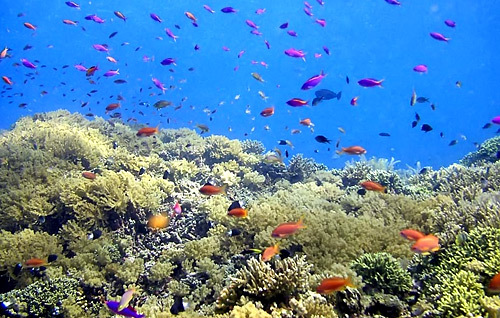 Bunaken National Park is Marine Park with the most various species in the world. The fascination under water life in water territory of this a real Bunaken national park varieties, specific, on unique, and exotic, make this area as the beautiful North Sulawesi tourism and grow as one of famous marine park tourism object in the world. It is because of this location nearness with Manado city that only about 6 km from the downtown area, or from Tongkeina in Pisok foreland even only 3,5 km. Access to this location also very fluent, can be gone through speedboat within 20 up to 60 minutes. The Reserve comprises of the Bunaken Islands, Siladen, Nain and Montehage, the dive and snorkeling sites are numerous and diverse. The drop off wall at Liang Cave in particular is rare in the world and described by enthusiasts as spectacular with caves, gullies and caverns harboring an immense wealth of marine life. Brilliantly colored fish dart amongst the vibrant coral and the water is clear and warm. It is ideal for the first snorkels or experienced who divers alike.